One of the more rare rewards in ES games are points added to your skill trees. 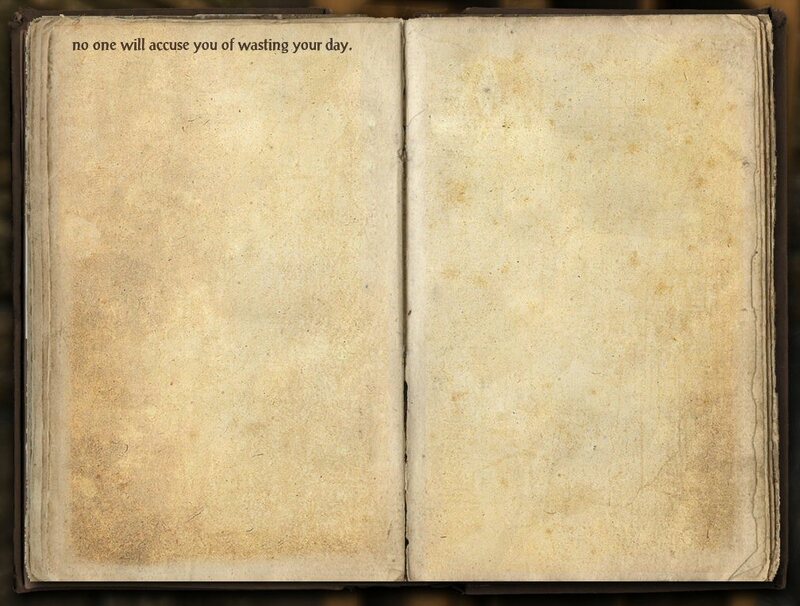 Typically the only way to gain them is by checking hundreds of bookshelves across the game world. A small percentage of them grant a point in a single one of your skill lines. Still, touching a bookshelf takes but a moment and there are so many in the game world that it's worth your time to touch the hundreds of them that are required to build up a measurable number of points. In the process of this, though, you'll encounter a lot of ES lore as well as in-game player guides (as well as funny stories, bawdy tales, hints to treasure hidden in the game, and the like). 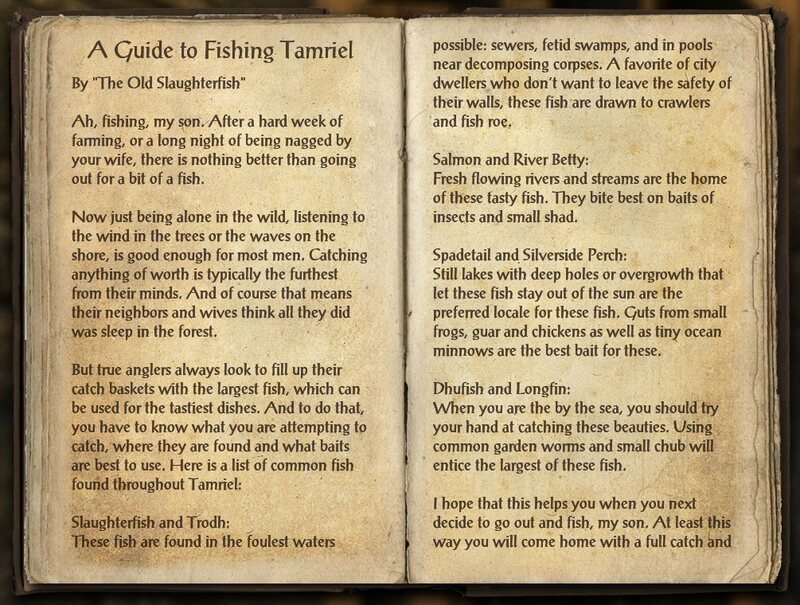 Did I mention there's a fishing mini-game in Elder Scrolls Online? There is. From time to time in the game's waterways, you will find splashing pools identified as good fishing spots. Sometimes, there will even be an NPC there fishing to give you the general idea. So far, it seems to be nearly the exact equivalent of mining in EVE Online: a dull -- if soothing -- way to make a small amount of gold per hour, about 600-750 per hour in most spots as far as I can tell. Swamps and sewers, bait to use: crawlers and fish roe. Rivers, bait to use: insect parts and shad. Lakes and pools, bait to use: guts and minnows. Ocean, bait to use: worms and chub. So you EVE players can think of those as mining crystals, I guess, except that you have to gather them yourself from various sources. Insect parts, for instance, come from the various insects that are available in each zone. Guts come from the level 1 creatures that wander through each zone. Crawlers are associated with undead kills. Worms can typically be gathered when uprooting harvestable plants. As far as I can tell, roe comes from using the wrong type of bait while fishing (you get roe instead of a fish). the more people who are fishing in a particular fishing spot, the more likely it is that you will catch those rewarding fish. This is almost insidious torment for some achievement-based players: to get 100% of the achievements in the game, not only will players have to indulge in this "game play", but if they really want those achievements, they're going to have to talk a large number of other people into it as well... That's gotta be social engineering at its finest. nice. boring though it may be, i've been trying this and apparently wasn't getting my bait right! Obviously, they want players to organize a fishing tourney. Just curious, as a resource gobbler myself (though without any assistance): how do you tell the bots? I mean, the invisibility trick is cute, but is there something about their movement that tips you off to the fact that they aren't under manual control? I might go bot hunting myself. They don't run, they insta-warp from resource node to resource node(as the 1st video shows) - if the node spots are empty at the moment, they can warp/check like 3 per second - can be hard to spot even the visible ones as they blur across the landscape checking for resources. Ah, that was the context I was missing. Yeah, that needs to go away with extreme prejudice. I've noticed that TESO has fixed locations for resource spawns. They should probably change that (maybe add a whole bunch more locations, and have the resources cycle randomly through them) so that this presumable bookmark->farm by teleportation trick doesn't work. I'd also like to know how they teleport. Hacks, or do they just have 8 characters per account, each by a known spawn points for resources, and log in/harvest/log out? Any char can probably sweep a whole zone in 2-3 minutes. They have all nodes mapped out and scripted. How they warp is not clear, I've seen some create a tiny splash while warping from a node one side of a creek to the other so may be a pure speed hack, not point-to point insta-warping. Banning isn't a solution, they can create fake CC#'s all day to crate new temp accounts. Zenimax needs a code fix, also some server-side position validation code - same thing some other MMO's have had to implement. As for the invisibility part, there is a tradeskillable alchemy potion for that but normally only lasts 3 seconds - they likely modified that code to last indefinitely.